Imagine Mount Katahdin's granite dome buried nine miles below the surface--it once was. Imagine the coast depressed beneath two miles of glacial ice; geologically speaking, that happened only yesterday. Imagine "Maine" at the equator, in the dry, landlocked center of an ancient supercontinent--microscopic clues in the bedrock prove that it was so. 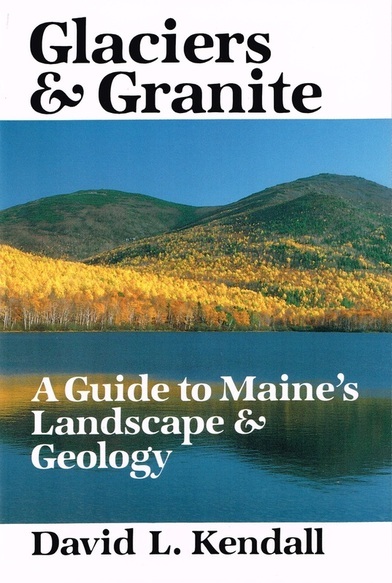 In Glaciers & Granite David Kendall vividly explains why Maine's landscape is so geologically varied and interesting. Whether you want to read about one particular place or to explore all of the state's outstanding features, Glaciers & Granite is the perfect guide. After several years as a mining geologist--doing mineral prospecting, geological mapping, and field research--David Kendall turned to teaching Earth Science. He also wrote textbooks, articles, and guidebooks, which explains his skill at making geology so interesting and accessible to laymen. "The State of Maine intrigues people with views of a rockbound coast, Mount Katahdin and lesser mountains, the great rivers, and many ponds and lakes. Such scenery is bound to its geologic setting and the processes acting on this and all sections of the earth. Geologists are constantly asked by travelers to explain the rock formations they have seen, or to answer questions as to how or why some feature of the landscape has developed. The author, with his experience in mining geology and in the field of education in earth sciences, is well qualified to answer many of the questions raised by the curious. This book minimizes the professional language of the geologist and speaks in the language of the layman, presenting basic geologic fact as related to particular geological features of scenic interest. While many geologic features are subtle and visible to only the professional eye, he has chosen those which anyone can observe along the commonly traveled ways of the state. Scenery is synonymous with the enjoyment of travel, and this book will surely add understanding to the enjoyment of Maine's varied landscape."